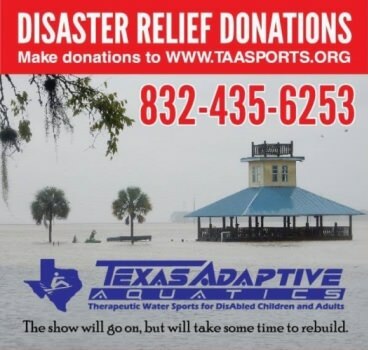 Help Rebuild after Hurricane Harvy for Texas Adaptive Aquatics | Kind.Fund: Crowdfunding and fundraising for personal causes and charities. Texas Adaptive Aquatics, Inc. (TAA) a non- profit 501 (c) (3) organization is pleased to submit this information for your review and consideration.TAA is in need of assistance to continue to help the disabled community through our water sports training program. TAA was founded in 1989 in Houston, Texas and incorporated in the State of Texas in 1990. TAA is committed to enhancing the lives of disabled children and adults through our recreational and therapeutic water sports clinics. Our program allows people with physical and/or mental disabilities the opportunity to discover the thrill and excitement of Water Skiing, Sailing, and Duck, Deer Hunting. In 2009 we expanded our program to include Private Clinics for our Disabled war hero’s and wounded first responders that have been hurt in the line of duty. Our facility on Lake Houston was destroyed by Hurricane Harvey. Due to the Amount of Damage we are relocating to higher, more secure location on Lake Houston. We have secured the property for our new facility on 3 Acres of water front. Our future plans for 2019 will consist of continuing our ski clinics as well as building our new facility. We are located on Lake Houston in Huffman, Texas. With this new facility we will be able to expand and offer more accessible equipment and new programs for our growing number of disabled participants. The new facility will expand our overnight sleeping quarters, give us more accessible bathrooms and also provide a larger dining and fellowship area which has been limited in the past to the outdoors. With the impact after the storm, fundraising has suffered and donations have been fewer. The approximate cost for the new design and construction is $400,000.00.We are an organization with a clear vision and a passion for the future.TAA is hopeful in a partnership with you and your company to help make our new vision a reality. Please visit our website at www.taasports.org or Facebook for further information about our program, as well as photos and newscasts of our clinics.We look forward to your partnership in our efforts to continue our Non-Profit water sports training program. Your support, kindness and generosity will help keep our programs free and enable us to continue to grow and reach more disAbled participants.